VTT Technical Research Centre of Finland Ltd has developed a mass production method based on printing technologies to manufacture patterned organic solar modules. The method enables freely customised solar modules to meet the architectural requirements of buildings and to add value to their visual appearance in addition to energy production. Organic solar modules can form even visually attractive multicolor graphical images. Thinness and flexibility allows the solar modules to be integrated in glasses or to be adjusted to conform on a freeform surface in building façades. The solar modules can also serve as intelligent interior surfaces that collect energy from indoor lighting, for devices such as sensors that gather information from the surrounding environment as part of internet of things applications. "In future, all visually attractive surfaces of the buildings can also harvest energy. The design, even multicolour images, can be implemented with solar modules. This enables the wide exploitation of solar modules as a natural part of the buildings and opens up significant new business opportunities,” says Senior Scientist, Pälvi Apilo of VTT, the coordinator of the LIWE façades project. The LIWE façades project is one of the winners of the Challenge Finland programme financed by Business Finland. PES Architects, one of the project partners, designed innovative building façade concept in which solar modules symbolising ice crystals through Chinese calligraphy are brought into glass façades. This concept was winning proposal in the design competition of the Sino-Finnish Congress Centre in Nanjing, China. It also received the Special Award for Innovation of the Architectural Review MIPIM Future Project. 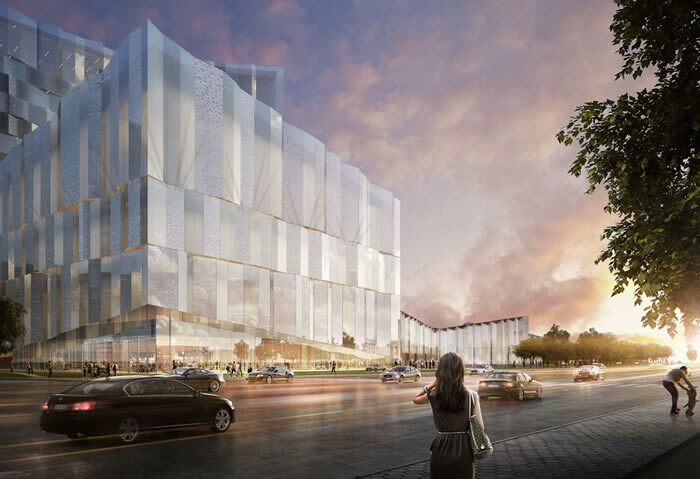 "The aim is to execute an architecturally interesting pilot location for a graphical solar module façade, as part of the Sino-Finnish Centre,” says Jarkko Salminen, CEO of PES Architects. “The product is expected to have an attractive cost-benefit ratio in the future, and its freely visually modifiable features will provide the solar module façade with huge international potential," continues Professor, Architect Pekka Salminen of PES Architects. The functionality of the glass façade concept will be demonstrated in LIWE façades project. In addition, a flexible intelligent solar shade system with Artic Kaihdin Oy will be developed. "Due to energy efficiency requirements, solar shading solutions will be an essential element of building in the future. Combined with the possibility of collecting energy from sunlight, this will take us very far along the road to energy-efficient construction," says Jarno Ahtonen, CEO of Artic Kaihdin Oy. In addition, in the project the use of coating materials on flexible and rigid surfaces are explored together with Optitune Oy to improve the usability and to maximise the performance of solar modules. “Optical performance, protection against abrasion and impurities are essential properties to guarantee the long term efficiency of the solar modules,” says Ari Kärkkäinen, CTO of Optitune Oy. In LIWE façades project, new business opportunities and commercialization routes are being explored. "For these new types of printed, designed solar modules, it is possible to create a completely new circular economy business models. The new products’ value chain may be very different to that of traditional solar modules, which will enable the market entry of new players," says Senior Scientist Marja Välimäki of VTT.